The dangerous effects of alcohol and smoking on our general health and internal organs are well documented. But the health of our teeth and gums is also greatly affected. The large amount of chemicals present in nicotine and the acidity of alcohol can damage your gingival tissue and greatly increase your risk of oral cancer. People with poor dental hygiene habits are even more likely to develop these serious and unpleasant conditions. There are thousands of chemicals in a single cigarette. As the point of entry to the body for these chemicals, the mouth of a smoker suffers greatly. Often smokers will develop a brown tinge around the mouth, which is especially noticeable on the lower teeth. The nicotine in cigarette smoke affects gingival blood flow, meaning gums are highly susceptible to diseases and damage that may be irreversible. Smoking transforms your saliva into a deadly cocktail of residual chemicals, which damage the cells in your mouth, causing cancer of the mouth, lips, and tongue. Smoking can cause heart and lung diseases too, and all of these can be deadly. Drinking alcohol can also lead to tooth decay, gum disease and oral cancer. Any form of alcohol, even just a glass of wine is acidic and can erode your teeth. It also exposes your mouth to increased levels of sugars found in alcoholic drinks, particularly those that are artificially coloured. In addition, alcohol dries out your mouth, reducing saliva production and drastically reducing your body’s ability to fight germs and disease. Whilst occasional alcohol consumption won’t necessarily cause problems, you should still take precautions. The bad habit of smoking and drinking increases your risk of mouth cancer by up to 30 times. Establishing healthier habits such as drastically reducing or cutting out smoking and only moderate drinking dramatically lessens your risk of oral cancer. Swishing with water after drinking or using toothpaste with a mild whitening agent can also fight the acidic effects of alcohol. It is vital to get into a regular habit of good oral hygiene, in particular, teeth brushing and cleaning between teeth. 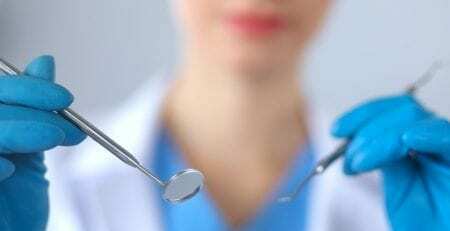 Receiving an oral cancer screening by your dentist every 6 months can help you to achieve optimum oral health. During oral cancer screening, we check the soft tissue in the mouth to see changes that could be dangerous. For early diagnosis, our Dentists will you refer to see a specialist as soon as possible. If you’re concerned about damage to your teeth or oral health, book a dentist appointment online at Blue Tooth Dental in Enmore for an assessment.